I’m considering investing in one of those daily pill holders as seen on every nursing home bedside table in the country. I don’t take any med’s but do believe in the power of vitamins. My daily routine of vitamins takes precious seconds out of my morning and rushes me, which endangers my life considering the fact I may choke and keel over in my kitchen whilst attempting to be healthier. Which makes one of those pill holder thingy’s sound pretty good right now…..
Pictured here are my daily doses from left to right. 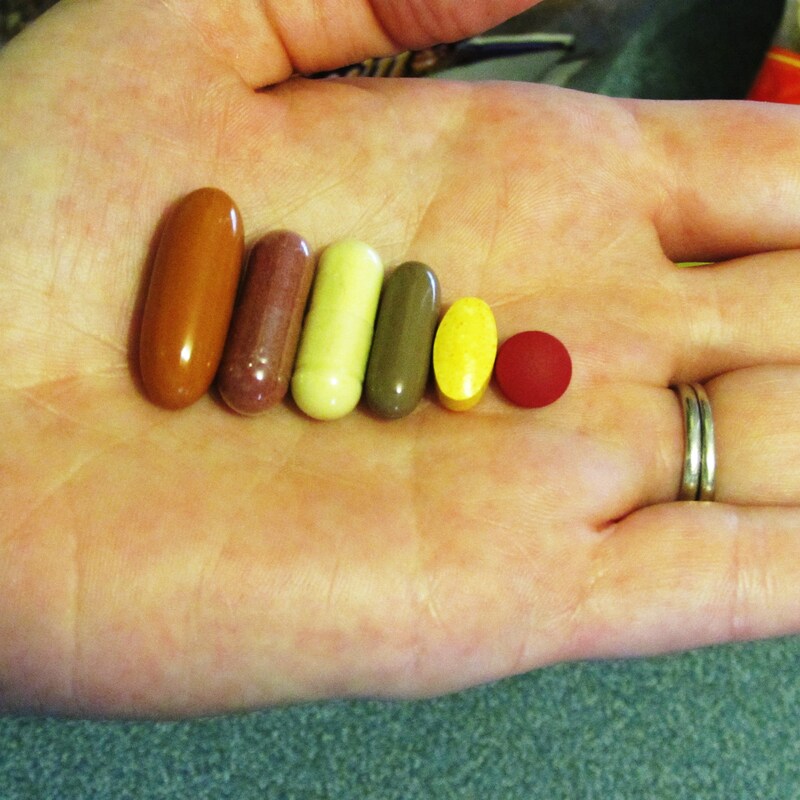 Vitamin C and D plus Omega 3 with a few other micro-vitamins thrown in for immune system support. Cranberry Extract for urinary tract health. I make sure this bottle is facing backwards when company comes over because seeing “urinary tract health” in print is kinda disturbing. Next up a Joint Supplement to keep “healthy flexible joints, shock absorbing capacity and lubrication”. Milk Thistle for liver function. My liver needs all the help it can get. Super B Complex. This one, the little yellow one near the end, is the only one I can actually tell a difference if I fail to take it. It is for energy. The last one there is Iron for my blood. Not sure what it does for my blood but I’ve heard being deficient in iron is bad. So I take a little extra. The joint supplement I actually bought for my husband at his request but then he hates taking pills and decided he’d just let his elbows suffer instead. I, on the other hand, had one to many Bloody Mary’s awhile back and decided, rather recklessly, to sign up to run a half-marathon. So I whipped out my Discover card, chose a t-shirt size and BOOM. In conclusion, December the 7th I’ll be in San Antonio, Texas to run 13.1 miles at 7:30 in the morning. Therefore I started taking my husbands joint supplement, this chick is gonna need all the joint support she can get. I must be completely daft.